The Dutch stole an early advantage over the Americans, setting a strong rhythm early on. Kent School did their best to counter the experience of their opponents, but Laga were relentless at pushing the pace and the younger Kent crew, despite their efforts, just couldn't keep up. Naga booked their place against Imperial College tomorrow with an assured performance, finishing one and a half lengths ahead. And that's it. Race 81, our final race of the first day of Henley Royal Regatta 2017, is complete. It's been an exciting and hotly contested day with very few 'easily' verdicts in amongst the results. Thanks for joining us, both on the Henley Standard website, Facebook and Twitter as we've live blogged the racing and local reaction. Join us tomorrow for more excitement from the river - and hopefully some better weather! The junior men's quads take to the water for our penultimate race of the day. The more experienced Westminster School took the lead early on but Northwich would not let the overlap go ensuring the last Fawley heat was not a done deal. A final push in the last 500m by Northwich gave Westminster a fright, but they were able to fend off their opponents, crossing the line just half a length ahead. An exciting race and a great performance by both crews. Our last heat of the coxless fours for the day saw The Tideway Scullers start strong and only extend the gap with every stroke. The umpire warned the Scullers over a wobble in steering which saw them giving Christiania dirty water in the final few hundred metres of the race, but a simple correction saw them unbothered, crossing the line comfortably a length ahead of the Norwegians. United Hospitals had a strong, clean start but were outclassed by the Cal crew, who are experienced Henley rowers whose number have taken home silverware in several different cups over the last few years. The University of California crew took the course almost as a training row, with United Hospitals trailing substantially behind them in what from early on was clearly going to be the afternoon's first 'easily' verdict. These two teams met in the second round of this cup in 2015. Thames took the win then, so Green Lake were keen to redress the balance, but to no avail. The Thames crew took an early advantage over the visitors, and despite the Americans' best efforts there was just no way for them to pull back against the more experienced crew who put a strong showing and must be a favourite for the latter part of the competition. An even-looking start for the two American boys' schools going head to head and rowing side by side for the first few hundred metres. Deerfield eventually managed to pull away, with the Haverford boys seeming to tire and slow somewhat by the time the two crews reached the middle of the course. Deerfield took the win by one and two third lengths. A powerful start from Imperial saw them take a strong early lead which Surrey could do little to counter, despite them giving it their all. Imperial crossed the line two lengths ahead, booking their place for tomorrow. Molesey had an unlucky early steering error which saw them veering towards their opponents. The Irish crew were unflappable, and steered towards the buoys to try and avoid them. As the two crews moved past Temple Island and into the main course water Commercial were able to pull ahead, putting clear water between them and their opponents and leaving them to row the rest of the race in a comfortable position. They will now meet Curlew tomorrow. Oxford Brookes remained unruffled while taking on UWE. They capitalised on an early lead to stay ahead in a commanding position. They crossed the line one length ahead of their opponents in a performance that seems to have left them with plenty in the tank for their next heat. A terrible start for St Paul's with one of the crew catching a crab within the first few strokes. A lesser crew might have been spooked by the error but they were able to adjust and find their rhythm and continue on despite the early difficulties. Dulwich College did everything they could to keep up, but St Paul's were just too efficient, finishing one and a half lengths ahead. Curlew started strong with an aggressive stroke rate which saw them half a length ahead within the first few dozen strokes which they were quick to maximise. But Leeds kept battling, ensuring Curlew couldn't take a win for granted. By the time they reached the enclosures Leeds was pulling back one stroke at a time with their cox urging them on until they were bow to bow. A thrilling photo finish saw both crews waiting on the water to find out who won. Leeds ruled to have won by four feet in one of the most exciting matches of the day. Brilliant stuff. A straight, purposeful start for Gloucester which gave them a clear water lead by the three quarter mile marker. Warrington kept their sculling rate up, ensuring Gloucester felt the pressure as the two crews entered the noise of the general enclosure. Despite a significant weight advantage, Gloucester had to counter the final push of the Warrington crew which saw them with overlap as they crossed the line. Gloucester win by three quarters of a length. A signficant early advantage to the Americans after Monkton Combe School hit the buoys before even really starting the race proper. They untangled themselves and adjusted their course, but it gave Kent the chance to find their rhythm and cement an early lead. Monkton Combe fought hard to try and regain the ground lost to their opponents, but to no avail. A big weight differential (almost 10kg per crew member) meant on paper Newcastle should have been a shoo-in here. But York weren't rolling over, and kept close to their opponents until the final third of the race. In the end London finished two and three quarter lengths ahead, with a powerful performance which bodes well for the next round. A comfortable win for London in the Thames Challenge Cup, with the crew - whose home stretch is Putney - having a clear water lead from very early on. Nottingham kept pushing but were just not able to keep pace with the Londoners, who crossed the line two and three quarter lengths ahead. Bedford's first strokes saw an early steering error which led them towards the buoys. They adjusted quickly, but lost ground having to move back in. The choppy conditions saw the umpire ask both crews to move away from the centre of the course, as at one point it looked like blades would clash. Bedford twice pulled ahead, and twice Curlew caught up. In the final third of the race the two crews were side by side and for a third time Curlew pushed ahead, opening up a lead. Bedford and Curlew were both then warned again by the umpire in quick succession, making for a nailbiting final as each steering adjustment narrowed the gap between the battling crews. Coming into the enclosures Bedford lost their line and a clash looked worryingly close. Curlew had one final burst and cleared the line first. Curlew were elated, but perhaps too soon. Bedford protested the result but it falls on deaf ears with the umpire. Curlew's win is confirmed in one of the most exciting races of the day. The Americans were victorious over Bristol but the British crew did everything they could to make the Americans work for it. Boston finished three quarters of a length ahead in the end, in a time of 7.06. HSBC had a rowing issue within the first few seconds of the race, which saw them having to do some speedy steering away from the booms. Cambridge 99 took advantage to secure an early three quarter length lead, before extending it into a clear water lead by the time they reached Temple Island. HSBC battled on admirably, but seemed to struggle with the conditions, despite keeping a good pace. Cambridge 99 kept clean strokes and a strong rhythm to finish three and a half lengths ahead. A debut for Montclair in this event, and their blade work shows they are worthy of their place in the junior men's eights event. Montclair pulled ahead early, with clear water between them and King's before the crews reached Remenham. They kept the pace to the end, and received warm applause by the time they reached the enclosure, with their assured performance making for an ideal first showing. A comfortable win for the Norwegians against Royal Chester. The Norwegians reached the barrier in a reputable 1.49, Fawley at 3.07 and crossed the finish line one and a half lengths ahead in a time of 6.50. We're back from the tea break, and the first heat back is an exciting start for the crowds on the banks. Both crews started well, but the increasingly choppy conditions meant there needed to be real concentration to navigate the course efficiently and without coming into difficulty with the booms or the wash of their opponents. Nereus was arguably more hotly tipped, but for most of the race the two crews were very evenly matched with them being neck and neck across the course. Nereus crossed the line two thirds of a length ahead of the Cornell crew, but the Americans fought till the last. A hard won victory for the Dutch crew. It's now tea time on Day One of Henley Royal Regatta. We're off for a well-earned cuppa and will resume this liveblog when racing restarts at 5.30pm. Following the quad's victory against Maidenhead Rowing Club, the Standard's Conor McLaughlin was able to catch a few words with the Star and Arrow's Hadley Butcher. He told us: "We got a good start. We knew they would be fast off the start so we let them do their thing and stayed with them. When it came to the middle stages of the race, we started chunking it away from them and we just kept it going till the end where we had clear water." The final race before the tea break saw Sport Imperial ultimately unbothered by Pioneer Valley Riverfront in an assured performance which saw them win by three lengths. The Imperial crew had clear water from early on and kept their stroke rate as low as possible to maintain the gap. This should stand them in good stead for the next round, as they move into it relatively rested despite the less-than-ideal river conditions. After the neck-and-neck excitement of the previous race, a change of pace here. Hampton put in an assured performance with a strong start that Monmouth could not hope to match. By the barrier Hampton was so far ahead that effectively they were able to row out the course. Their stroke race was relatively slow, while Monmouth put in a final push to minimise the gap between the two crews. Hampton's one and a quarter length lead does not reflect the distance between the crews throughout the race. Another exciting Temple heat thanks to two closely-matched and hard working crews. Trinity started well to take the lead, but Pembroke was doing all they could to eat into the lead by Fawley. Pembroke had a big push by the enclosures, and a clearly-rattled Trinity responded well. Both crews clearly gave it their all, but Trinity ended the race as they'd started it, crossing the line under a length in front of their opponents. The Tideway Scullers took a strong early lead, but Riverside weren't letting them get comfortable, gaining ground throughout and putting in a massive push as the two crews hit the enclosures. Riverside fought hard and closed the gap, but the finish line was just too close, and in the end Tideway Scullers' School took the win, by just three quarters of a length. The Riverside crew looks exhausted - they put everything into that and are clearly disappointed that on the river today it just wasn't quite enough. Our last local crew of the day is taking to the water, with Star and Arrow being based at Henley's Leander Club. Star and Arrow took an early lead and looked assured as they continued to Temple Island. Maidenhead looked more laboured, but ensured that Star and Arrow weren't able to pull away, keeping overlap between them, seemingly for a last-minute sprint. But by the general enclosure Star and Arrow were finally able to pull further ahead, taking with them Maidenhead's hopes at closing the gap and crossing the line with clear water between them as they finished two and a quarter lengths ahead. Durham University A had around a length's lead by Temple Island, and were only able to extend the gap as the race continued. Edinburgh pushed back in a final sprint, but ultimately were unable to make up the ground, with Durham finishing three quarters of a length ahead. A tight start and two crews close to each other through the early part of the race made ongoing difficulties with steering for the coxless crews in the washy water particularly nailbiting. The German crew got several warnings for moving into the middle as both crews battled the wash, with their blades looking close to striking their opponents' at several points. Eventually Westfalen was able to pull ahead slightly, although there was still overlap between the two crews which made for dramatic scenes as the crews went past the enclosure, when there was a collision of oars in the dying strokes of the race. A tough race in worsening conditions but in the end the German crew was victorious by just half a length in an exciting finish. Pangbourne started well, with a strong and measured pace which looked leisurely and easy but quickly gained speed. The Windsor crew didn't let up, but despite their best efforts they just couldn't match the pace of their opponents. Pangbourne finished one and three quarter lengths ahead. The New Zealanders started strong, but the Cantabrigian crew were calm and well paced and pulled away quickly to build their lead. The Kiwis are notorious for last-gasp pushes to put their opponents under pressure, but by the final few hundred metres of the race Cantabrigian had made sure there was too much ground for Avon to make up. Cantabrigian won by one and three quarter lengths. The Dutch crew started strong, looking poised in the grotty conditions. The two crews were neck and neck through a lot of the early part of the race, with Groningen eventually pulling ahead much to the delight to some vociferous spectators in the enclosures. Cornell gave it their all, but despite the pain on their faces, they finished two lengths behind Groningen who progress into the next round. A good showing for Bristol who beat Maidstone by four lengths having been mostly untroubled by them throughout the heat. The Washington-based Gonzaga School started well against Great Marlow and Sir Steve Redgrave's old school were never able to make up the ground. By the last few hundred metres Gonzaga were able to take their foot off the gas. Marlow were flat out trying to pull back, but there just wasn't enough course left for them to make it. Gonzaga cruise into the second round off the back of a three length lead on the Marlow crew in an assured performance which should stand them in good stead and leave them rested for the next round. Agecroft started with an early lead and were able to keep ahead throughout, but London really made them work for it, staying close throughout. In the end Agecroft were three quarters of a length ahead, although London got achingly close to drawing level in the last few hundred yards, until at one point when they seemed to become caught in their opponents wash and Agecroft were able to pull one more burst out of the bag to see them home. The Henley Standard's Conor McLoughlin has spoken to Shiplake College's Director of Rowing Dave Currie after their win against Westminster at 2.30pm. Shortly after the race he told us: "I think we executed the race in the way we intended. We knew Westminster were going to come at us pretty hard off the start so we raced with that in mind. The boys got off the start really well. "They feel it wasn't their best performance off the start but we got ourselves in front. Credit to Westminster, they are a strong crew and its unfortunate we had to race them this early in the regatta but that's how the draw goes. The guys controlled the race well. They through everything at us but the guys responded to that and won the race." It's always a shame when two foreign crews meet each other in the first round, as it makes for a very short regatta experience for the travellers. In this case it's Worcester who finished disappointed, with Santa Clara beating them to the line by two lengths. This is the first time Latymer has qualified for boys quad, and sees them with three crews in various cups over Regatta. Suffice to say they're going to be happy with this as a first showing. Latymer started well and while it took them time to get ahead, some quality sculling saw them with clear water on their opponents by the time the crew reached Fawley. At one point Latymer got an umpire's warning to move back towards their own station, having steered into the centre, seemingly in reaction to some nerves at the rough water moving them towards the booms. The quad finished ahead though, beating Marlow by one and a half lengths. The London crew was specially put together for this race and is made up of students from Princeton University. Taurus started fast and were able to move easily away from the London crew who never caused them any trouble. Taurus had a leisurely row along the course, and will be rested moving into the next round when they take on Newcastle University. The official results show Taurus finished two and a half lengths ahead but that doesn't reflect the difference in ability between the two crews on the day. Another exciting heat with two hotly tipped crews. At the half way point Mercantile seemed to have trouble with their rhythm and lost ground, but pulled it back so by Fawley Molesey were only just ahead. Molesey's steering went to pot shortly afterwards, possibly due to tiredness or an increase in wind off the water, giving the Victorians a chance to pull through. Mercantile beat Molesey by one and a quarter lengths, and the British crew will be disappointed to be out on day one. Our first heat for the Temple Challenge Club is an exciting one. University of Virginia beat Goldie by one and a half lengths. The two crews were evenly matched and both dug deep in the conditions. Lea were victorious against Auriol in a strong performance which saw them finish three lengths ahead. Starting on the Berks station, Lea reached the barrier by 1.54 and just kept gaining water from thereon in. They crossed the line at six minutes and fifty seconds. Our first local crew on the water this afternoon were really made to work for it, thanks to the all-pink clad Westminster crew. While Shiplake started strong, Westminster put them under considerable pressure and didn't give them a chance to sit back and relax. The locals finished two thirds of a length ahead, but it was a nailbiting race and Shiplake's performance should see them get a long way in this cup. The Irish crew started well and Malvern tried to pull it back to no avail. Clonmel finished two and a half lengths ahead, booking their place into the next round with relative ease in a time of 6 minutes 55 seconds. An exciting race for London Rowing Club, all of whom had RUBY written across their arms, in honour of Head Coach Pete Hardcastle's two-day-old daughter. The club's newest addition was clearly a good luck charm, as London put in an assured performance, even in the choppy conditions. London crossed the line two and a quarter lengths ahead, in a time of 6.48. York was given several warnings for straying too far from their station during the first part of the race, despite starting ahead. Thames C did as much as they could to pull it back and they put York under considerable pressure in the final moments of the race. But York crossed the line half a length ahead, in a time of 6.41. The American crew put out a good showing against Exeter. Starting on the Bucks side, they reached the barrier by 1.49 and were at Fawley by just after the three minute mark. Cornell finished two and a quarter lengths ahead, crossing the line in 6.30. 2pm We are heading back to course for the first race after the lunchtime break. Radley College led from the off, and while Episcopal Academy did everything they could to pull it back it was a big ask, when by a third of the way through the course there was clear water between the two crews. Radley finished one and a half lengths ahead, crossing the line in a comfortable 6.30. Final race of the morning and a Weybridge crew against an American crew. Very short strokes from the Australians off the start and as they’ve raced in Europe earlier in the month. They look very drilled with an early square. The Australians look very controlled, utilising the tail wind and it’s working well. A comfortable lead past Fawley. A very big crew from America have overpowered the Weybridge boys and have a comfortable lead. This is a good race. The St Georges boat are keeping the rate high and racing the course but aren’t in touch. Another eights race. A step up for the UL crew who are racing a strong American crew. At the 500m mark the UL cre are length up as both crews settle into a strong rhythm. The Americans hang on to the tail of the UL crew and don’t lose sight of them. UL try to increase the distance at Upper Thames aiming to edge the distance away. Williams College hang in and keep the overlap. There isn’t any clear water. They might be out of the eye line but you can hear them stroke for stroke. No clear break for UL in this third quarter. The Williams Crew are working hard and draw back some distance. Both crews pushing for that line. Buidling the pace. UL start the sprint for theline with only half a length between the crews. Williams take it up and leveraging the blades, trying to make the move back. UL react, being more comfortable. UL don’t look threatened and take it up again as they see the line Still overlap but in the last 6 strokes take it cleanly, to a length. Worcester push into Leander off the end of the Island but Leander doesn’t flinch and take a canvas lead as they enter the booms. Leander start their campaign up the course and move away to half a length lead at the 500m mark. Leander are comfortably ahead at the enclosures and are not taking the rate up as Worcester follow their race plan. Leander take the applause and have a comfortable stable row to the line as Worcester race it. Coxless fours and both crews are reasonably straight – a lively start. The Northwich crew gain an advantage but the Lea are not letting them get away. A very close race. The steering is in the two seat in the Lea boat. These crews are stroke for stroke. Through the three quarter mile, past Remenham Club and they are still fighting this out one on one. Both crews are being warned to move apart. This is a gut wrenching side by side race. Lea take the rate up and are warned for steering again. A lot of encroachment but they react and they take the rate up. A little wobble from the Lea gives Northwich a canvas. They need to keep focused. They build the stroke rate again as they hit public enclosures and the umpire is calling the steering again this is a really close race and the Lea are being warned because they don’t want to be disqualified and the Lea hit the blades of Northwich in the last five strokes of the race. Lea were out of their water and do not contest the result. Northwich beat the Lea by a few feet. Coxed fours and the distinctive stripes of the Dublin crew, with a university crew against a junior boys crew from America. Deerfield are warned and both crews are told to move apart but Deerfield have a slight lead but Trinity move back. This is stroke for stroke along the first 500m. Trinity might not have the horsepower of the American crew but they have the stroke skill. This is one crew taking the lead over the other through each crews push a real tussle from each crews race plan and race profile. Coming through half way the y are side by side with a bow ball between the crews. Trinity are keeping the efficiency . Deerfield are still a nose in front. Rating 36 from Trinity. Deerfield slightly lower. This is all still to race for. Neither crew is willing to give the race away. Coming into the enclosures and the crowd will lift these crews as they start to sprint for the line. How are these crews going to race for the line? Trinity raise the rate. Deerfield follow. This is true race for the line. Deerfield at 43 trinity at 40. Deerfield take the line by a few feet, maybe a canvas. Leander pink against King’s School Worcester – two junior boys quads and Leander/Star and Arrow have a good start. Star and Arrow move up well but this is still a close race as the King’s school stay in touch. The King’s move back up not giving an inch. Good steering from both crews and into Upper Thames it becomes a real one on one race. Star and Arrow put in a big push and move away and break, moving up to a length. Leander move away again in front of Stewards, rating 34 and being in control are able to take a lower rate into the finish line. Chris Daniell was in the Star and Arrow Club A crew which beat The King's School, Worcester, in the Fawley Challenge Cup heat. He said: "We had a race plan which I think we executed quite well. The start was a bit washy but then we got a nice rhythm. "We raced them earlier in the year and they beat us by a length of two so we thought it was going to be a close race. It's pretty tough once you're behind and to get back into it. "It was nice first race. We have got a really tough race tomorrow so I think we're going to go out with the same race plan and go for it. We've got nothing to lose." Derby hugging the Island but a small crab from Derby pass the island give Thames the advantage though Thames hit the buoys at the same time. Thames recover quicker and the Derby crew have to get back into their rhythm. A stronger Thames crew move away and dominate the race and pull away in front of the Barn Bar and coming up to the barrier. The Thames crew are controlling this race and have moved away to an easily verdict, looking good with a solid row, setting them up for the rest of the week. Derby are pulling some of the distance back as they go past Remenham Club but they can’t make up the gap as Thames have a solid controlled rate, around 30. Thames have a comfortable relaxed row past the Steward's Enclosure whilst Derby race for the line and close the gap but Thames win comfortably. A local race with big rivalry between the schools who both train on the Thames. Abingdon break away off the start and move to half a length off the top of the island. Reading are really going to have to dig deep. Abingdon move away again and at the Fawley mark they are into three or four lengths. The Reading crew had to qualify for this race and despite fighting back seem to have lost touch at Upper Thames. The Abingdon crew look solid and are in control as they come into the enclosures. Under-rating the Reading crew Abingdon are commanding this race. Reading keep fighting past the grandstand but the Abingdon crew take the applause and take the race in a relaxed manner. Freddie Bryce, cox of Blue Coat School's eight which lost to Abingdon School, said: "I think we did what we came out to do. We know they are a stronng school, but we raced how we wanted to race and didn't leave anything on the water. "There was a lot of wash but the boys dealt with it well and I'm proud of them." Ben Grainger added: "We did our best and I'm happy with our performance. It's just that Abingdon were a stronger crew. "The result was almost expected but we're very proud to get this far. "We tried to push them off the start to scare them a little bit but they're a big crew. They had a fantastic start and used that to their advantage. "This is my last year at Blue Coat so it was a good race to finish on." Two university eights, the crews are level at the end of the Island but the Notts crew move to half a length lead at the 500m mark. They keep that lead, though Southampton react. Notts had to qualify and have done well to reach this race. The cox moves off the Notts station and the umpire warns them. Southampton react and draw level at Upper Thames. This is a true one on one race. At Public Enclosures they are side by side and then Southampton come back with a big legs push. Southampton grab the initiative and move to half a length as Notts start to look a little ragged . Southampton take the rate up as the noise rises from the grandstand. The Southampton cox holds her nerve and they power to a length up and take the line. A tail wind has developed up the course. A long calm hold for these two eights and the loud shout of the coxes ‘draw’ from Vesta. The Japanese crew are well drilled and very focused and into a decent lead as they come into the bouys. At the 500m mark they are very sharp and solid despite being quite a small crew, having a length lead over Vesta. They move to a two length lead as they pass the barrier as Vesta struggle to respond. Vesta qualified but this is a tough draw against this very tight Mitsubishi crew. At Upper Thames the Japanese are winning this comfortably, with a good solid row up the course and moving well together. Mitsubishi are rating 36. Vesta haven’t let up on the rate but aren’t in touch. Consistency is the word to describe the Japanese crew still up at 36 at the public enclosures, who are not letting up, despite the fact they have this race in the bag, bar any disasters. Coxed fours, pretty neck and neck as the French University stay in touch with Newcastle. Newcastle settle into a pace. Coming into the halfway mark Newcastle have a comfortable lead over the French team and are powering it through. This has become a bit of a procession for Newcastle as they come up the public enclosures and take the applause at the Stewards Enclosure. They have coped well with the water and despite Lyon taking the rate up they are in a comfortable position to take the line. Sydney stray dramatically as they have pushed right over to the buoys but Sydney are causing this problem and a few shouts from the Bristol boat. The Sydney crew are still too far over as they come into the booms. City of Bristol have hung onto this race and are attacking all the way down the course. The flag is out from Guin and Sydney are being warned continuously. Bristol move ahead at Upper Thames and both crews are being warned by the umpire. Sydney responds and draws level. Bristol move ahead into the public enclosures. The money was on Sydney but the Bristol boys have challenged them all the way down the course. If the crews clash in front of the grandstands but this is going to be Bristols race. The Bristol crew move away again and are looking like they‘ll take the line. As they take the applause they take the win and they’ve worked for this race. A lot of pain in the Sydney crew. University of London have an early lead though the cox strays slightly off the station. A win for UL over Bucknell University comfortably. The rowing Tennis and Hockey Club against another German crew. A slightly unfortunate draw. The Bayer crew have an early lead over the Hamm crew, by a canvas. Both crews are powering it through and not letting the rate drop at the 500m mark. The Bayer crew are around 38 and are edging through to a length lead. At Upper Thames the crew are both rating the same but the Bayer crew are maintaining their lead. At the public enclosures the Hamm crew are moving into the Bayer crew and closing the gap winding in the distance. Three quarters of a length is a narrow gap. The coxes are working hard in this race as Hamm are hanging in with the over lap. This is going to be a sprint finish. Hamm take the rate up and Bayer respond at the grandstands, maintaining the lead. This is a race to the line by about two thirds of a length. After a very long pause the crews are under way and the coxes have a little bit of a tussle along the island. St Albans move slightly through to the middle. A very aggressive start from both crews and they are side by side a the 500m mark. The Americans settle into a relaxed rhythm and pull away as the pass the quarter mile. Norwich react to the push and stay in touch – they need to keep their heads in the race and stay in touch. The Americans want to move away at the barrier but Norwich are staying in touch. This is real one on one racing. On the quiet patch of the course coming through the mile where the cox’s voice takes over and the Americans push through. Norwich are one length behind keeping the bows in touch. At Upper Thames, the Americans start to put their stamp on the race and move to clear water.. the Americans have a different rig to the Norwich crew but both have tandem rigs where two rowers follow each other directly rather than pulling blades on opposite sides. Past the public enclosure they will feel the build of the crowd into Stewards and the Americans have a comfortable lead. Norwich seem to have a slightly shorter stroke and are working the rate whilst the Americans are comfortably moving through to the line. A very close start between the boats and the St Edwards cox is a little over from the Bucks station. They have the advantage and at the 500m move away to move to clear water at Upper Thames. As the wind hits St Edwards look long and loose and move to an easy verdict over Latymer, who seem to be being out-powered. St Edwards still take it up at the public enclosures as Latymer disappear. Both crews push for the line and St Edwards are comfortable over the line. Their coach Johnny Singfield will be happy. Both crews are side by side as they enter the booms from Temple Island. The American School carve out an early lead and begin to press away from the Tideway Scullers crew. Scullers have a wobble with the steering whilst the American school have a good line. Scullers are sculling in the puddles of the American School, not a good place to be. Into the public enclosures the American School which have a very different stroke profile to the Scullers are three lengths up. They have a comfortable lead but still take the rate up. They take the applause from the Grandstands, and the line from the Scullers crew. Brookes are still in touch with the Dutch crew at the 500m mark and are not letting the Dutch crew have the race in the bag by Remenham Chruch. However, by Upper Thames the Dutch have clear water and are underrating the Oxford Brookes crew. Oxfrod Brookes may not be aware of this. The power is still being put in by a calm rowing stroke from the Dutch. The Dutch come into the stewards Enclosure with a good first half of the race (3.01 to the first mark) and have stayed in front with a comfortable row. Oxford Brookes are being overwhelmed in this race. Coming in front of the Grandstands the movement of the Dutch crew is rowing beautifully winning the race easily. The Germans are in the lead but the Nottingham crew are not letting them have clear water as they pass Upper Thames. The Germans have a slightly heavier crew and are underrating the Notts crew. The German crew are a little neater than the Notts crew but the latter team are not letting their opposition open clear water. The noise rises from the enclosures and the Notts crew react. Hamburg feel the pressure and take the rate up with a drive to the finish. Notts get overlap into the last 100m but the German crew are stayiung ahead and are pushed to the line. German win by ¾ of a length. A very colourful combination from the Dutch crew against the dark colours of the Fulham Reach crew. Another race of coxless boats, Fulham have their hand up. The Dutch are frig rigged. The Dutch have a quicker first stroke but steer into the middle of the course. They are warned very loudly by the umpire. They will have to get back on to their station soon! They are back into their rhythm. That was a tricky start. The crews separate as they come into the booms and the Dutch move away to clear water at the 500m mark. That was an interesting start but the Dutch are in command of the race. The Fulham reach crew continue to meander but aren’t warned because they are not interfering with their opposition. This is a mucky race steering wise. Past Upper Thames the Dutch crew settle down to a good solid rhythm with that noise of a strong finish, contrasting to the slightly more flippant finish of Fulham Reach. Fulham reach put in a push into the Public Enclosure, but are out of touch with the Dutch crew who seem to have a few characters on board. Fulham Reach hit the booms and come to a grinding halt at the grandstands. A moment they will want to forget and puts paid to any come back. The Dutch react by taking the rate down. Both crews have had issues with steering down the course and politely row over the finish line allowing the opposition to gainsome composure after that disaster. Very similar team colours with Durham on the Bucks station closest to the Island. The Durham crew pull away straight from the start, with clear water at the 500 m mark. The wind has developed but these coxed fours are solid in the water and Durham university are looking very comfortable. At the Public enclosures Durham are two or three lengths up. University of London look round in the crew but they are struggling to match the power rhythm that Durham have. Past the grandstands and despite London taking the rate up and fighting for the line Durham win easily. A wobbly start from both crews – no intervention from Richard Phelps but the French crew – who seemed to be heading for the booms are strong and pull ahead of the Army. Grenoblois have medaled nationally in France and have a strong history at international level in the club. The French crew are meandering a little and it looks like they might get a flag wave but then they move back of their own accord. They are keeping the umpire on his toes. Grenoblois move away to clear water and have a good rhythm and are maintaining the distance away from the army. At Upper Thames the Army put in a legs ten but are not denting the French lead. At Public Enclosures the French crew take it up a pip and power through again. Army react but don’t look like they gain any water. Army move to the middle of the course but aren’t warned as they rectify the steering themselves. The French crew are springin through to the finish in their stroke a nd are solid to the finish. Aviron Grenoblois beat the Army easily. Shrewsbury seize the initiative and take an early lead over the Americans. This is truly global race but at junior level weight difference can really count and the Shrewsbury School are heavier than Tabor. At Upper Thames Shrewsbury have clear water over Tabor and are solidly rowing through to the Public Enclosures. Rating equally the heavier crew is keeping its lead. Tabor take it up into the grandstand to attack but are out of touch with the Shrewsbury crew. The first local crew with a good race off the start. Royal Chester go out hard with a slight lead at the 500 m mark. They keep that lead and extend it to a length at Upper Thames . The Royal Chester boat has ex junior internationals with UTRC unable to match the technique in the Chester boat. A tough draw for UTRC against these ex squad boys. At Upper Thames there are shouts and UTRC put in a burst right on time. Putting Chester under pressure. Can UTRC maintain this lift, as the bow man looks across. This is going to be a race to the line. Chester need to keep their cool as UTRC take it to a quarter of a length lead, and UTRC are really fighting Chester react and up the rate. This is going to be a race through Stewards. Chester raise the rate and drive on . This will be enough to see them home. This has been a great fight to the line. Royal Chester win by three quarters of a length. Jake Richards, who was in the Upper Thames crew which lost to Chester Rowing Club in Thames Challenge Cup heats, said: "I think we didn't get the start we wanted - we were slightly down off the start which kind of put us into a fight. "We were working on our rhythm and we didn't quite execute that and the boys from Chester held on the entire way." But he added: "I think we're quite pleased, especially how far we've come the last few weeks - we put this crew together quite recently. "The loss isn't disappointing, the disappointing part is we didn't execute our race as we would have liked to." Nervous coxes mean it’s a quick shout from the umpire off the start and it’s a very impressive start from the Australians. They are powering it into the booms with a very early lead. A nice long loose rhythm. Bath are trying to keep in contention but there was no subtlety in the race plan from Queensland. Bath are in a good rhythm but they are being out powered by the Australians, who have a length lead at Fawley. Queensland are another crew who have an interesting rig with two and three in the boat following each other and bow seat being stroke side. King’s Queensland are very close to the booms, just before the mile, flirting with danger by being very close to the booms indeed. The cox needs to move back as the stroke siders seem to out power the bow siders. This could have been a hairy moment for this eight. Bath stay in their race but the timing is not as smooth as the King’s Queensland crew. Bath are not giving up and take it up but don’t make a dent in the Australians lead. A very impressive power row. Maidenhead have a wobble at temple. It’s really challenging these uncoxed boats along the island. Within the booms the Radley Mariners move into Maidenhead but Maidenhead have a lead of a length at Fawley. The Maidenhead boat is frig rigged so there are two bow siders following each other, with the stroke man steering. The boats get a little too close together as they pass Upper Thames and are warned by the umpire. Maidenhead have to move out of the middle of the water. Radley Mariners have a wobble on the steering and are warned. Then Maidenhead move into the middle and the flag moves to them being warned. This is a bit of a meander along the course. Not the way you wish to eb introduced to Matthew Pinsent as an umpire. Maidenhead have the lead into enclosures and are comfortable though Radley are fighting on. Maidenhead win over Radley Mariners. Two schools eights. Eton beat St Pauls in the final of this race last year. A very tight race off the start, with good steering from both coxes. Eton have a slight advantage over Bedford at Remenham Church. Coach Alex Henshilwood has a strong set up in the Eton crew and Eton are showing the depth of talent as they move to a couple of lengths lead at Upper Thames. Bedford will have to work hard to stay in touch. At public enclosures the Eton crew lift despite their lead and move to clear water over Bedford. Guin Batten is umpiring this race, her first, in a distinctive white blazer. She will have officiated over a clean race with Eton winning comfortably over Bedford. Another tweak from the Yale cox steering the crew next to Temple Island but they take a commanding lead against UL into the 500 m mark. The wind is getting up and UL seem to be a little outclassed by the Yale crew who are making a distinctive sound as they power up the course. American crews tend to have a very strong finish to the stroke and are chaining the puddles. This is a good row, with the cox at them every stroke, despite the clear water they have. The varsity boat beat Harvard in their university clash, and are having a strong confident row up the course, being in total control over UL, who despite the fact they have taken the rate up are not making a dent in the Yale lead. Yale win comfortably with a solid powerful row, never looking fazed by the challenge of UL. Molesey have to correct off of the start and both crews are stroke for stroke as they come up to the 500 m mark. Kingston edge a slight lead as they hit Remenham church. Molesey are still in touch at Upper Thames, but Kingston move again to push to a length lead over Molesey. This is a real turn-around from the last regatta where Molesey won. Kingston beat Molesey –last years winners. Kingston will be ecstatic. There seems to be a pause at the start. Lea are given an official warning for being late on the start, and awarded a false start. This is a race for junior boys in quads so it could be an issue with nerves. Not often you see such offences. Lea have a wobble but they are ahead at the end of Temple island by a canvas as Marlow are in their stride early. Marlow don’t seem to react to Lea moving out at the 500m mark and into the Barn Bar they are moving to a length. Marlow will have to dig deep against the east-end boys in orange. Through Fawley to Upper Thames there is clear water and the Lea are very much into their stride, commanding the race. Lea continue to push away from Marlow and look composed doing their thing – maybe it’s the sunglasses despite it’s still very grey and dull here in Henley. Marlow take the rate up as they look round the two man making the calls. At the public enclosures you can hear the supporters yelling to get Marlow back into the race. Marlow dig deep as they come to stewards, but it doesn’t look like they will take the win earlier in the season into Henley. Lea win comfortably despite that early issue with timing. An all American line up of coxed fours. Both crews put in a hard start and this is going to be a tough race with a slight lead from Colgate at Upper Thames. This is really tight in the middle section of the race. This is real side by side racing with both crews feeling and seeing the others energy and rate changes. University of Virginia are hanging in and Colgate try to push them off at the Public Enclosures. This is a stroke for stroke race. There is still time for Virginia to catch Colgate. Colgate shorten and take the rate up – Do they have this race? As they hit the Grandstand both crews giving their all in the last 100m. Colgate grit their teeth and take the line. A tough opening race to get to the next day at Henley Royal Regatta. The first international crew racing against a tideway crew. Auriol have a wobble off the start heading for the island and then back towards their opposition, the umpire having to raise the flag in warning. They’ve paid the price for their steering as they move through from Temple Island into the booms. Auriol have steering issues all the way down the course from the start. They are effectively sitting behind their opposition, with the Australians having an easy row down the course, talking the rate right down. The Australians carve out a huge lead and take the rate down to decent steady state row, tapping over, whilst the Auriol crew are fighting to get back in the picture. Winchester have a little over-steer along the island into the middle of the course, but as they come into the barrier they are pulling away from King’s at Fawley they are ahead by more than a length. King’s are over-rating but not making much of a gain against the Winchester lead. Winchester move to three length lead – it should be noted they have an interesting rig as they are bow side stroked and still have bow side bow man with 6 and 7 on the same side. Interesting combination. Winchester have a comfortable lead into the public enclosure. King’s are fighting all the way but they have lost sight of their opposition. This looks like an easy verdict as Winchester lower the rate as they take the applause into the finish. 3-0 to the bucks station. 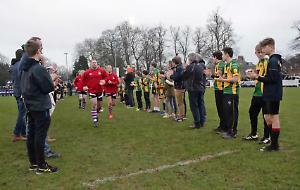 Winchester beat King’s School Chester. Brookes won this last year against Harvard. Again at the start the boats are level as they come into the booms. But Brookes are rating lower than Imperial. Imperial are hanging on in as Brookes power to a quarter length lead. Imperial seem to be a smaller crew and are rating higher than Brookes to stay in touch. Past Remenham Oxford Brookes maintain their lead opening to a length. A very neat race but Oxford Brookes pull out and take it up as they come into the public enclosures with a long powerful stroke. They are in command of the race and it looks like it’s 2-0 to the Bucks station. Clapping from Stewards and Oxford Brookes win over Imperial by a length. 81 races in total today and City of Oxford, against Thames Rowing Club, have the honour of the first race of 2017, on a dull grey but not windy morning. Rain overnight will have raised the river but won’t affect the stream, given the river has been 14cms lower than normal – swimmers on Sunday had the luxury of 21 degrees. There is very light traffic on the river at this time of the day so this should be a good fast race. Two nervous coxes line up their crews and you can hear the gentle rumble of the launch that will follow them. Thames are on the Bucks station, closer to Temple island. Both coxes have their hands up and are making adjustments. As soon as the hands are down the umpire calls Attention, slight pause, go. The initial first couple of hundred meters is crucial dealing with the currents against Temple Island. Both crews clean out of the blocks and out of the buoys into the booms. As they reach the booms the crews are level with a really solid start. They are truly side by side – an even contest. Thames pull away to a canvas at the 500 metre mark but City of Oxford respond. The Thames crew look comfortable with a solid rhythm thought quite a bit of body movement in the boat. City of Oxford are still in touch through the quarter mile and up towards Upper Thames. The conditions are good and Thames pull away to a length at Fawley. Both crews have raced a very straight course and the umpire hasn’t had to do any work – which is probably a relief to Boris Yankov who had some controversial calls last year. Thames are inching out every stroke and keeping their composure. At Remenham they have clear water and head into regatta enclosure in clear command of the race. The Thames crew is staying in their bubble and are under rating the Oxford Crew who have just put in a push at the public enclosure still going for the line. The decrease the distance between the boats but Thames react to calls from Stewards and build for the finish line the cox calling all the way. Having led by a length or more for three quarters of the race, they win comfortably. It’s one of the Thame s guys birthdays!!! Quite a present. Welcome to Henley Royal Regatta 2017, the 178th year of the event, held on the River Thames in Henley, over a boomed course covering 2,112 metres (1 mile, 550 yards). This is side by side racing at its best, where the winner can be decided in the last five strokes – as happened last year when a boat hit the booms 2meters from the finish line. What will racing hold this year? For local Henley rowers the big events are going to be the Upper Thames race at 10:00am, the Reading Blue Coat against Abingdon race at 11:40am and the Shiplake College race at 2:30pm. Star and Arrow, a second stream of rowers training at Leander, are also racing in composite crews and local faces, such as yoga teacher Kara Andrea, who is coxing N.S.R. Oslo, Norway at 5:35pm, can be seen in various boats.